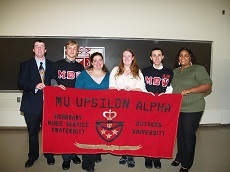 Historically, Rutgers University has had two band fraternities, Kappa Kappa Psi and Mu Upsilon Alpha. Kappa Kappa Psi was chartered at Rutgers as an all-male honorary Fraternity in 1942 as the Alpha Phi chapter. According to the national rules of Kappa Kappa Psi, no women were allowed to be initiated into the order. When Rutgers went co-ed in 1972, the RU Board of Governors mandated that all honor societies throughout the University admit women. It was suggested that the members create Kappa Kappa Psi’s sister sorority, Tau Beta Sigma. 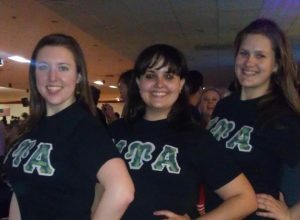 “A bandmember is a bandmember”The Rutgers Chapter felt that creating a Chapter of Tau Beta Sigma was against Rutgers policy, as well as their own morals. They agreed that “a bandmember is a bandmember” whether they were male or female, and everyone should be able to serve music if they wished to do so. When the Brothers informed National Headquarters of their intentions to initiate women, they recognized that they had 3 options: initiaite women ans risk expulsion from Nationals, establish Tau Beta Sigma and violate University rules, or delay pledging until National Convention in hopes that they could change the Kappa Kappa Psi Constitution. 1. The desire for a co-ed fraternity. 2. The unreasonable national financial obligations. 3. The lack of support from the national organization. The brothers unanimously decided to continue the pledging process despite the consequences. In response, their charter was revoked. Two days later, on November 13, 1972, Mu Upsilon Alpha was formed. Of the 28 new brothers, 13 were women. In 1978, Kappa Kappa Psi too went co-ed. Since that time Kappa Kappa Psi has made countless efforts to re-establish the Alpha Phi chapter. However, the Brothers of Mu Upsilon Alpha have declined,and continue to let their Fraternity which they built from scratch grow and flourish into the Mu Beta Psi Chapter they are part of today.